Hello, i am holding a singapore passport and i came to chiang rai in early march and am set to return end of this week however i am considering to stay longer till end of songkhran festival with my relatives. Are there any options to allow me to stay in thailand for more than 60 days. No visa applied beforehand, only given the 30 days allowance stay in thailand when i arrived. Is it possible to apply for a visa in the immigration office* located here or i am able to apply for the 30 days extension stay thing. No, you cannot stay for more than 60 days and there is no Thai Embassy in Thailand! 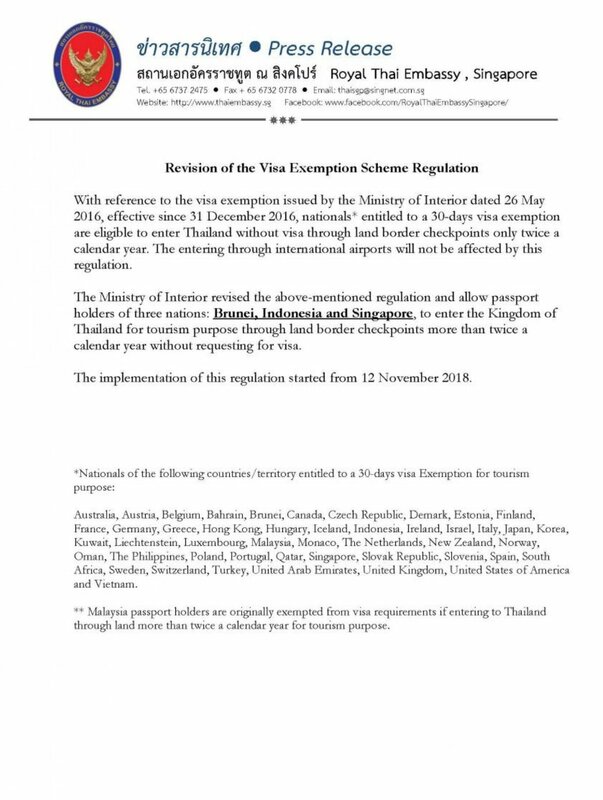 If you have not already done so you can apply for a 30day extension of your visa-exempt entry - 1900Baht at a Thai immigration office. If you arrived in early March, 60 days (30 days visa exempt plus one permitted extension of 30 days) will take you nicely " till end of son﻿gkhran festival". What is the problem? The 2 visa exempt entries per year at land borders rule does not apply to citizens of Malaysia, Singapore, Indonesia and Brunei, effective 22 Nov 2018. Not sure that actually happened. You can apply for the 30 day extension at a immigration office for a fee of 1900 baht. As a Singapore citizen you qualify for one. You do not have to have a visa to qualify for the extension. I have not seen anything official from immigration about it. They are the ones that have to implement it. The Ministry of Foreign Affairs has nothing to do with visa exempt entries. That falls under immigration the same as visas on arrival do. I have not seen anything official from immigration about it. I guess I missed that one or may of gotten about it. I check regularly for them. I suspect not many people from those countries make that many border hops for new visa exempt entries.